Besides Christine McVie was Dennis with any other well known women? Nah, because Mike never recognized her as his (Mike's) daughter, and Mike is never wrong. One of Mike's wives....altho i guess outside of BB world she wouldnt be well known. I wonder how many women Dennis slept with? I do wonder if its like 100 or if its more like 2,000 or something like Wilt Chamberlin numbers? Dennis was born in 1944. I'd guess he reached puberty around 1957. He then lived another 27 years. 27 years multiplied by 365 days = 9855 days. According to her book, yes. 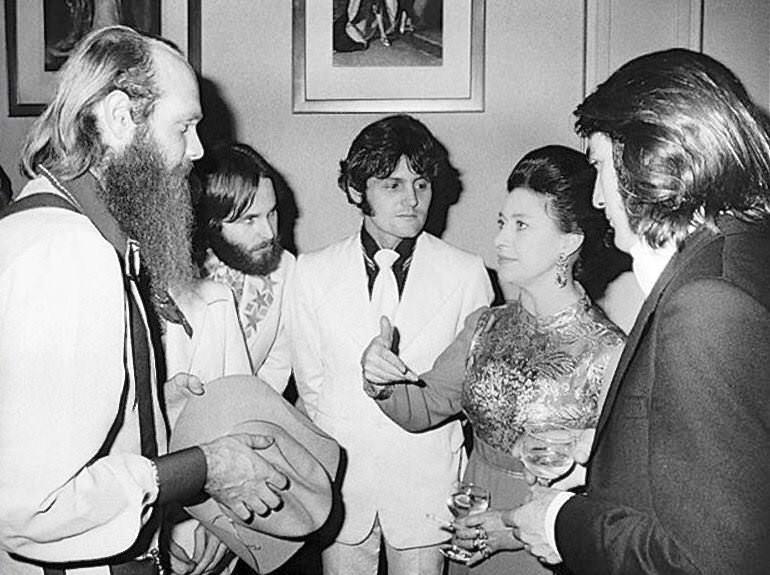 There's a picture of the Beach Boys meeting Princess Margaret in 1971. She was substantially older than Dennis, not a great beauty and was married, but she had the reputation for being the "naughty" member of the royal family. I wonder if Dennis at least tried to bed a princess. haha i didnt know they met her....i found the pic....he is looking at her with what could be considered a naughty look in his eye...but hard to tell from the pic....hahah. Apparently she met the beatles too, found pics of them together also. Rehashing what you already said about her age, marriage, etc... Shes about ~10 years older than the BB, born in 1930....she would've been about 41 here, BB's wouldve been in early 30's here....Also she looked decent for her age, tho, in my opinion. I would not be at all surprised if Dennis tried to work some of his old Drummer magic....although she was married from from 1960-1978, so who knows. Could've been a sham marriage since they were in the royal family and divorce is super, super frowned upon, especially back then. Anyways, no idea why I'm spending so much time writing about/researching this. Hopefully someone finds it interesting. I sincerely doubt it. He had much more of an appetite for the young ones. If it did happen, he probably got a bag of gold dust. If the question is ‘well known’ women you have to include Manson’s girls. She would've been 14 years older than Dennis. The photo is from 1969 or 1970, so he would've been 26 at the most. Mtaber is a SS board treasure! How many ladies were there that multiple BB members dated the same lady? That picture of Mike's dome really belongs on The Weirdest pictures of Mike Love thread. How many confirmed children from DW? What did membership in the 'Golden Penetrators' entail? With a group focus and set goals, these numbers could have been very large, and being Hollywood, it's possible some of the women have been well known. I believe you got a--er, "membership" card...and special medical discounts. I met Patti at Ed Roach's and Trisha Campo's (then Roach) home around '72 or so(? ), and she was quite open about her relationship with Dennis. She repeated a really funny story about something Dennis said to her, but I haven't read her book, so don't know if I should repeat it. I believe her dad approved his burial at sea that was unusual for someone out of the military. As far as older women, that was fine with him, too. ;-) There are several of those stories, at least one of them being famous. I have no idea about Princess Margaret, but if so, they probably had fun. Dennis liked women and the favor was returned. Many of the temper explosions I heard from Grillo's office on Ivar in '69-'70, had to do with lawsuits and Dennis's exploits. He was very, very busy. I don't doubt MTaber's estimate of #'s, nor the 5 days' off ;-) - good one. Dennis was prolific in so many ways, but when he was in love with a particular woman, he was madly in love, that was fun to watch. Thanks for the recollections, Debbie. It makes me think that Denny might have had a more prolific music (and/or acting) career if he wasn't as busy gettin' busy! Well, there's that! Then again, I think some of the women inspired his best music. I did also get to see Dennis at Christine McVie's. He was genuinely awed by her talents (she was a sculptor as well as a recording artist) and was proud to introduce her to brother Brian. Christine was amazing. I know a lot of people are a bit hostile to Karen. I didn't feel that way. She was highly complex, had a very difficult, abusive childhood and was really funny. Dennis described her (during a bad period) as "really entertaining." They both were. And they both "gave as good as they got". Later in her life she was an animal activist. Not long ago, I was watching a DVD of the oft-forgotten '70s TV show, Harry-O (starring David Janssen)... anyway, in the pilot episode, I saw that Karen had an acting role, and I nearly did a spit-take. Made me wonder how many TV show/movie sets Denny may have visited with Karen around that time. Powered by SMF 1.1.21 | SMF © 2015, Simple Machines Page created in 0.138 seconds with 21 queries.